Read the first issue of this magazine, published in 1936 (PDF format). 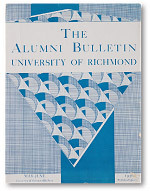 When the first issue of this magazine rolled off the presses in 1936, its masthead read “The Alumni Bulletin.” The name was only temporary, an article explained; alumni would suggest something better. It stuck until 1971. More than the name has changed over the publication’s lifespan. I should know. On a bookshelf opposite my desk are 11 faded green cardboard boxes containing the magazine’s entire archive, my inheritance when I began occupying a Puryear Hall office earlier this year as editor. As I thumb through the pages of this remarkable gift, their scent is musty, like long-lost memories. From top, covers from 1954, 1962, 1972, 2005, and 2013. Consider the year in which he wrote those words. In 1936, the Nazis reoccupied the Rhineland; the coming war would worldwide claim 60 million souls, give or take, within the decade. At home, recovery from the Great Depression was ongoing, uncertain, and contentious. Readers didn’t find any indication of this wider world in the first issue’s pages. Those who opened the cover found a Page 1 story about a $500,000 fundraising campaign for a central library (now Boatwright) and a women’s gymnasium (now Keller Hall). All eight pages have a familiar feel: stories of alumni accomplishments (a weatherman to Charles Lindbergh, an archivist for the state of Pennsylvania), messages from administrators, and invitations to homecoming. The back cover has surprised everyone to whom I’ve shown it. There, an illustrated, impossibly handsome young couple under a starless sky is lighting Chesterfield cigarettes. “A match can tell you a lot,” the advertisement suggests, suggestively. Social attitudes about smoking might have shifted, but come-hither marketing strategies endure. Continuity and change nestle side by side throughout the issues that follow. Students learn and graduate; alumni build families, careers, and communities; and class notes ebb and flow. Around them and through them, the institution changes, too. As the University looks increasingly forward and outward, so does the magazine. Over time, students, faculty, and alumni in these pages look and dress differently, and speak of new realities, even as they cradle timeless hopes. As the covers at right show, the magazine has changed its look and feel every bit as much as hair lengths and hemlines have gone up and down. The cover looked far different when FDR crushed Alf Landon than when Neil Armstrong stepped on the moon or the World Trade Towers fell. In the months ahead, we’re taking another fresh look at the magazine. Our goal is to make it more relevant, thought-provoking, and satisfying to read, and more beautiful to look at; to move it, as one alumna suggested, from her obliged-to-read pile to her pleasure read pile. We expect to roll out a new magazine as the Class of 2017 arrives this fall. Our goal would be familiar to Dr. Boatwright: to reflect an institution ever striving to be worthy of you, our readers.